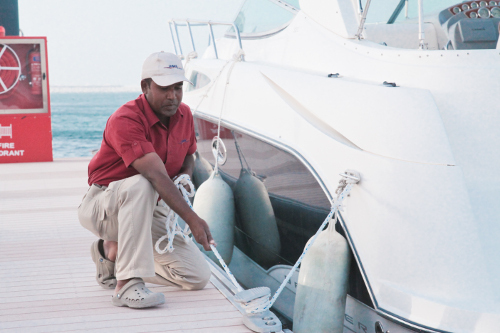 From time to time, Mourjan Marinas may need to amend these Terms as a result of things such as changes in law, best practices or changes in the services offered. Mourjan Marinas hereby reserves the right to change these Terms at any time, without notice. Any changes to these Terms will appear on the website and we kindly ask you to regularly review these Terms. Your continued use of any portion of this website after any changes to the Terms shall constitute your acceptance of these Terms as amended from time to time. Through its website, Mourjan Marinas provides you with access to various resources, including news, communications and information. All content and information displayed on this website ("Information") is the property of Mourjan Marinas or its affiliates, parent company, related entities or third party licensors, and is subject to these Terms. This website, as well as the websites of Mourjan Marinas affiliates, parent or related entities ("Mourjan Marinas Companies"), may contain or reference trademarks, patents, copyrighted materials, trade secrets, technologies, products, processes or other proprietary rights of Mourjan Marinas and/or Mourjan Marinas Companies or third party licensors. No license to or right in any such trademarks, patents, copyrighted materials, trade secrets, technologies, products, processes and other proprietary rights of Mourjan Marinas and/or Mourjan Marinas Companies or third party licensors is granted to or conferred upon you. This website may provide you with the ability to use usernames, passwords or other codes or devices to gain access to restricted portions of this site ("Access Codes"). The content contained in such restricted areas is confidential to Mourjan Marinas and is provided to you for your personal, non commercial use only. Mourjan Marinas reserves the right to prohibit the use of such Access Codes at any time, without notice. The entire content of Mourjan Marinas website is copyrighted under various UAE and international copyright laws and, except where explicitly indicated, Mourjan Marinas is the exclusive owner of the copyright or is licensed to use the copyright materials by Mourjan Marinas Companies or third party licensors. You may print and download portions of the Information solely for your own personal, noncommercial use. Any other use, copying, distribution, publication or transmission of any portion of the Information is strictly prohibited without the express written permission of Mourjan Marinas. You agree not to change or delete any proprietary notices from any Information rightfully downloaded and printed from the website. Mourjan Marinas logos, trademarks and service marks or Mourjan Marinas Companies logos and products and service names are trademarks of Mourjan Marinas, Mourjan Marinas Companies or their relevant licensors ("Mourjan Marinas Trademarks"). You agree not to display or use Mourjan Marinas Trademarks in any manner without Mourjan Marinas prior written permission, which may be withheld in their absolute discretion. All other trademarks, product names and company names or logos used, displayed or otherwise referenced on this website are the property of their respective owners. Your use of this website does not confer upon you any right or license to use the Mourjan Marinas Trademarks or any other trademarks. This website is for informational purposes only. The information found on this website is provided "as is", without warranty of any kind, either express or implied, including but not limited to the implied warranties of merchantability, fitness for a particular purpose, expectations of privacy, non-infringement or title. Mourjan Marinas and Mourjan Marinas Companies do not warrant that the functions of this website will be uninterrupted or error-free, that defects will be corrected, or that this website or the servers that make it available are free of viruses. Mourjan Marinas and Mourjan Marinas Companies do not warrant or make any representations regarding the use or the results of the information in this website in terms of its correctness, accuracy, reliability or otherwise. In No Event Shall Mourjan Marinas and/or Mourjan Marinas Companies be liable for any damages whatsoever resulting from or otherwise in connection with use of this website, except where such liability cannot be excluded by applicable laws. This is a comprehensive limitation of liability that applies to all damages of any kind, including but not limited to direct, indirect, incidental, special, punitive or consequential damages, loss of use, loss or corruption of data, loss of income or profits, or loss of or damage to property or claims of third parties. With respect to all communications you make to Mourjan Marinas regarding the Information, including but not limited to feedback, questions, comments and suggestions: (a) you shall have no right of confidentiality in your communications and Mourjan Marinas and Mourjan Marinas Companies shall have no obligation to protect your communications from disclosure; (b) Mourjan Marinas and Mourjan Marinas Companies shall be free to reproduce, use, disclose and distribute your communications to others without limitation; and (c) Mourjan Marinas and Mourjan Marinas Companies shall be free to use any ideas, concepts, know-how, content or techniques contained in your communications for any purpose whatsoever, including but not limited to the development, production and marketing of products and services that incorporate such information. By submitting any such communication, you warrant that such communication does not infringe the intellectual property or other rights of any third party. You further agree to grant Mourjan Marinas and Mourjan Marinas Companies a non-exclusive, royalty-free, worldwide, perpetual license, with the right to sublicense, to reproduce, transmit, distribute, create any derivative works of, publicly use or display any materials or other information, including but not limited to, ideas, concepts or techniques for new or improved services and products, you publish to the website by any means or by any media now known or hereafter developed. By using the website, you agree that you will not use the Information for any purpose that is unlawful or prohibited by these Terms. You agree to comply with all applicable laws, rules and regulations of the United Arab Emirates, the country in which you reside and/or the country from which you access the website. You acknowledge and agree that Mourjan Marinas and Mourjan Marinas Companies may preserve your personal information and may also disclose your personal information if required to do so by law or in a good faith belief that such disclosure is necessary to comply with legal process or to protect the rights, property or personal safety of Mourjan Marinas, Mourjan Marinas Companies, its users, customers or the public. Mourjan Marinas shall manage your personal information in accordance with its Privacy Statement. Any Information which contains any descriptions, specifications, drawings or prices of the goods or services is published or submitted for guidance only. The Information may contain technical inaccuracies or typographical errors. Mourjan Marinas reserves the right to make changes, corrections and/or improvements to the Information (including errors in pricing, design and specification of the goods and services), and to the products and programs described in such information, at any time without notice. This website, along with the websites of Mourjan Marinas Companies, contain information on worldwide products and services of its affiliates. Not all products and services are available at all Mourjan Marinas or Mourjan Marinas Companies locations. A reference to a particular product or service does not imply that such product or service is or will be available at a particular location. This is a United Arab Emirates website and is subject to United Arab Emirates law. Mourjan Marinas and Mourjan Marinas Companies (where applicable) will disclose any information regarding the use of this website, including personal information pertaining to you, without your permission when required by law, or in good faith belief that such action is necessary to investigate or protect against harmful activities to Mourjan Marinas, its affiliates, their customers, employees or property, or to others. This website and the features, facilities and amenities described and depicted herein may include information based upon current development plans. Such plans are subject to change without notice, and there is no guaranty that said features, facilities and amenities will be provided, or, if provided, will be of the same type, size or nature as depicted or described. Unless otherwise specified any such features, facilities and amenities are provided for illustrative purposes only and all dimensions shown are approximate. Mourjan Marinas reserves the right to modify the layouts and designs, and change the features, facilities and amenities of any development plans at any time. These Terms were last updated on 21 July 2013. Download a map of our locations..